The sabre is the modern version of the slashing cavalry sword. As such, the major difference between sabre and the other two weapons is that saberists can score with the edge of their blade as well as their point. In saber, the target area is the entire body above the waist, excluding the hands. The lower half is not valid target, which is meant to simulate a cavalry rider on a horse. In addition, saber employs rules of right of way which are very similar to foil but with subtle differences. Like foil, the fencer who starts to attack first is given priority should his opponent counter-attack. However, saber referees are much less forgiving of hesitation by an attacker. It is common to see a saber fencer execute a stop cut against their opponent’s forearm during such a moment of hesitation, winning right of way an the point. Again, as in foil, the saber fencer’s uniform features an electrically wired metallic lamé, which fully covers their valid target area. Because the head is valid target area, the fencer’s mask is also electrically wired. One significant departure from foil is that off-target hits do not register on the scoring machine, and therefore do not halt the fencing action. Saber fencing is also the first of the three weapons to feature a wireless scoring system. If epee is the weapon of patient, defensive strategy, then saber is its polar opposite. In saber, the rules of right of way strongly favor the fencer who attacks first, and a mere graze by the blade against the lamé registers a touch with the scoring machine. 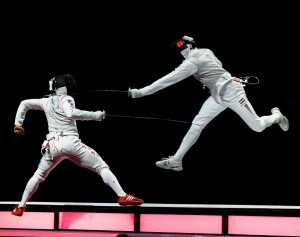 These circumstances naturally make saber a fast, agressive game, with fencers rushing their opponent from the moment their referee gives the instruction to fence. In fact, a lopsided saber match can literally be over in seconds. As fending off the attack of a skilled opponent is nearly impossible, saber fencers very rarely purposely take the defensive. However, when forced to do so, they often go all-out using spectacular tactical combinations in which victory or defeat is determined by a hair’s breadth. Athens was the first Olympics to feature a Women’s Saber event.